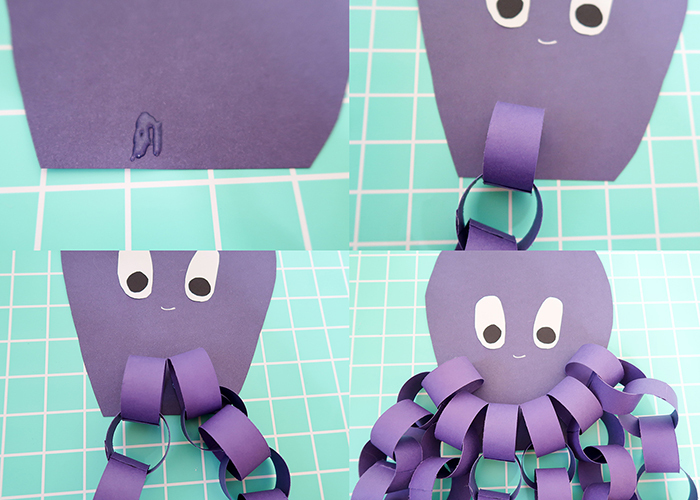 Today I’m sharing how to make this Paper Chain Octopus Craft! 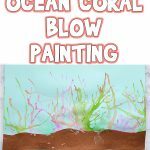 This is a perfect addition to an under the sea birthday party, or a classroom unit on ocean animals. 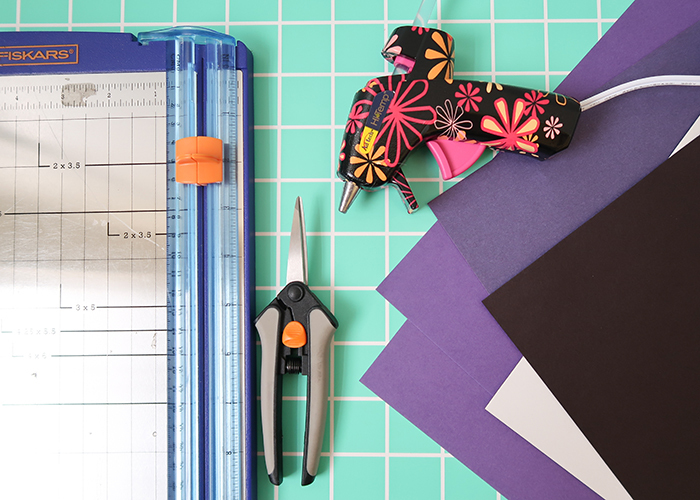 It’s super fast to make, so let’s get started! 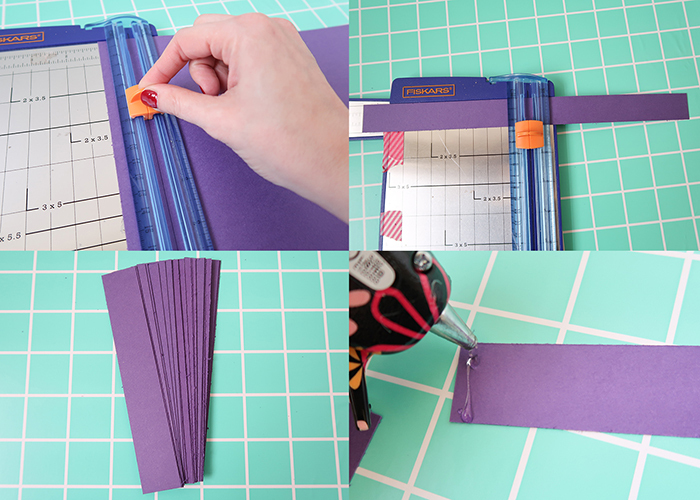 Start by cutting your some of your paper into 6 inch long by 1 inch wide strips. You’ll need 60 strips total. 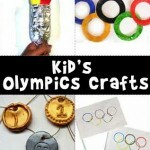 Now we’re going to make paper chains! 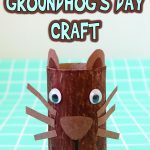 Place a strip of hot glue at the end of one strip, and roll it into a circle, overlapping the ends to glue them together. 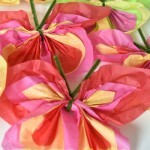 Thread the next paper strip through the circle, and glue it in the same way. 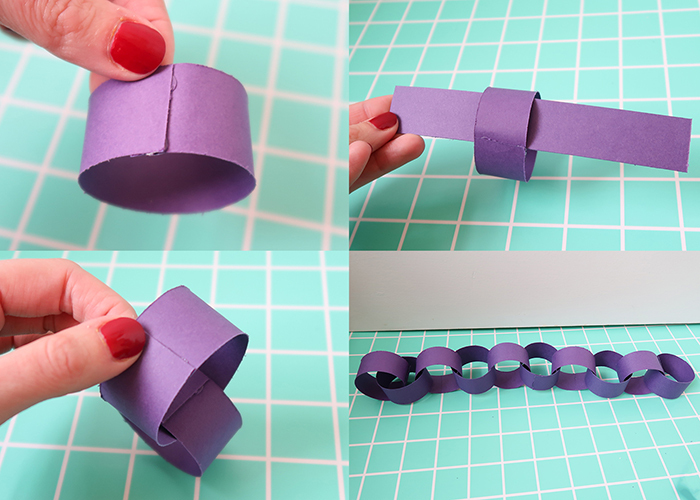 Go ahead and make your paper chain 10 circles long. Now make 5 more, for a total of 6 paper chains. 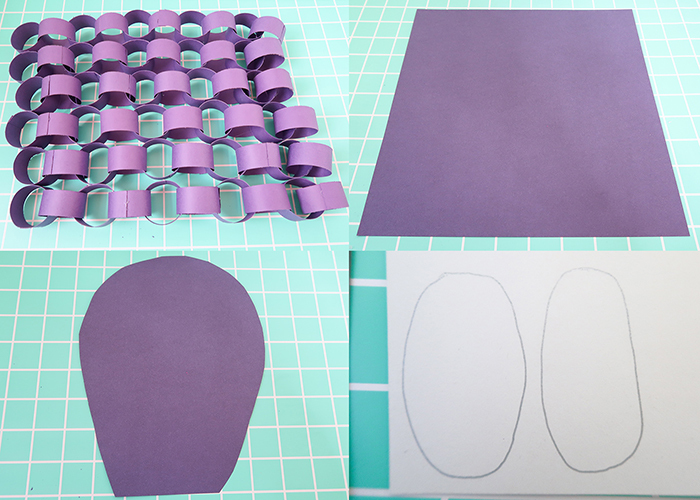 Next, you’re going to take another sheet of purple paper and cut out an octopus head shape. It’s similar to a hot air ballon, with a wider base. Make the head fairly large. 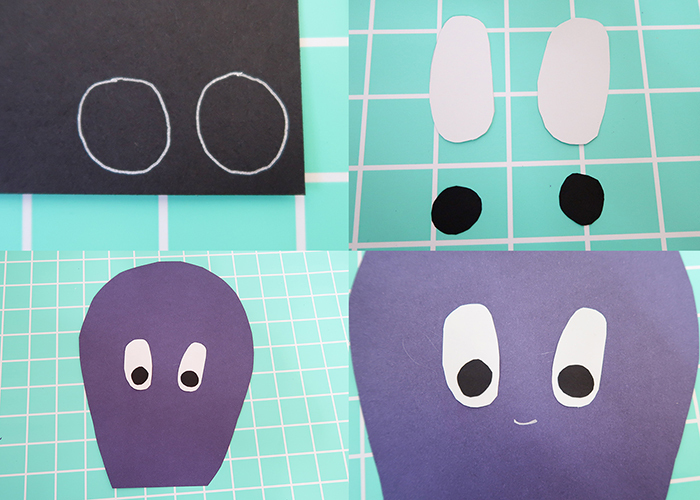 Then on your white paper, draw two large oval eye shapes. And on your black paper, draw two round eye pupil shapes. Cut out both pieces of the eyes, and glue them onto the octopus’s head. I also took a silver pen and drew on a cute smile, but you can leave your just with eyes, or decorate it’s face any way you would like. 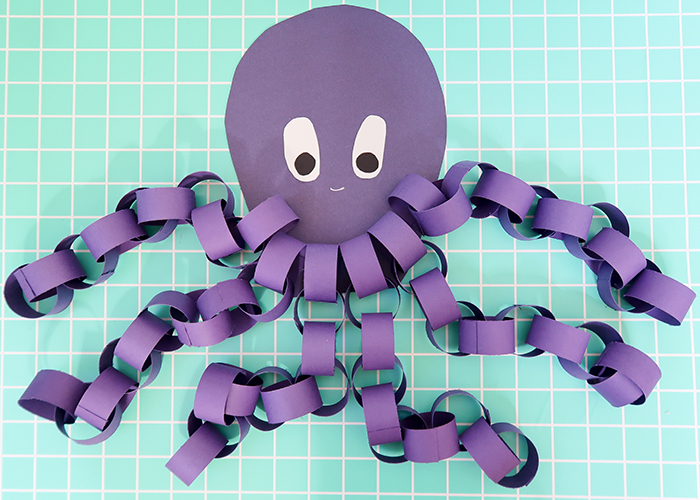 Now place some glue near the bottom of the head, and start gluing on your paper chain tentacles! You’re all done! 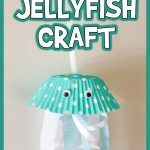 You can hang your octopus from the ceiling or pin it on a bulletin board. You could also do what I did in the top photo and find a place where it can sit, and drape the tentacles over things. 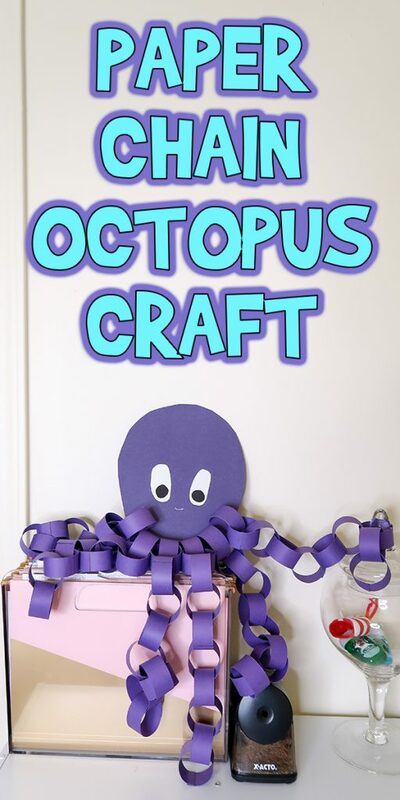 I hope you had fun learning how to make this Paper Chain Octopus Craft!